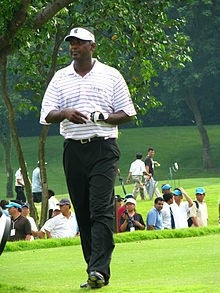 Vijay Singh (born February 22, 1963 in Lautoka, Fiji) is a PGA Tour golfer. He has won The Masters in 2000 and the PGA Championship in 1998 and 2004 and was the leading PGA Tour money winner in 2003, 2004 and 2008. He was added to the World Golf Hall of Fame in 2006. Vijay also won the FedEx Cup in 2008. This page was last changed on 5 December 2015, at 19:07.